There is war in the system of Fomalhaut. The first settlers, the post-human Quicks, have been conquered and enslaved by the Trues. But now the Ghosts have appeared: unknowable, powerful and determined to drive out the Quick and the True. 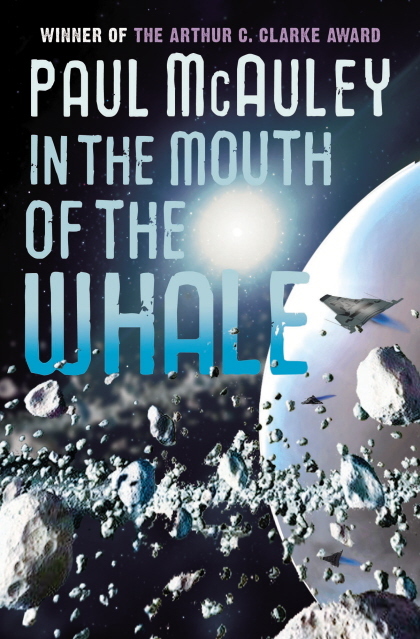 On the skin of the Whale, suspended in the atmosphere of Fomalhaut's gas giant planet Cthuga, Quick slaves remotely control drones and bots but have no freedom of their own. Ori dreams of flight, but there is no escape from her slavery - until the Ghosts attack the Whale. In the ensuing battle she sees a sprite in the corner of her mind, and comes to the attention of someone - or something - with a deadly plan. Isak and the Horse, summoned from the thankess task of harrying endless Hells, are given a mission that will lead them into the dangerous politics of the Fomalhaut system, and into the most deadly Hell of all. And in a damaged and perilous Brazil of the long ago, the Child lives with her mother and nursemaid, kept safe from the risks of the rainforest. Precocious and dangerous, her childhood will define the future. But control of her story has been lost, and she will find her own path through the darkness around her. These three lives intersect at Cthuga, where something dangerous and powerful lurks in the unfathomable core. Something that is worth fighting for. Something that will change everything.